Just as we fill the park with chairs and tables for relaxation and passive enjoyment of the space, we also try to fill the days with ways to actively use the park. We've got ping pong and petanque, fencing and yoga, to name just a few. 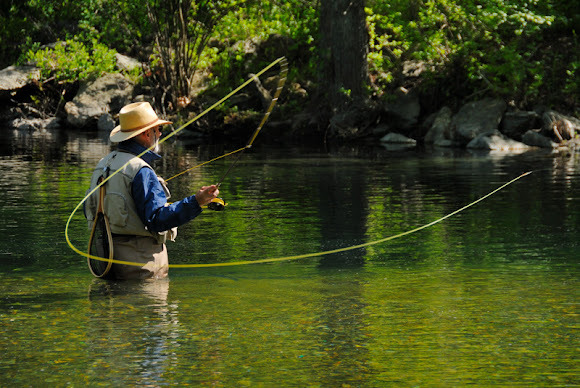 And new for this year, Orvis is bringing you free Fly Fishing instruction, coming to the 5th Avenue Terrace at the end of the month. This trusted sporting outfitter has a store just up 5th Avenue from the park, and they thought our shady terrace would be the perfect place to demo fly casting and outfit rigging for the adventurous city dwellers. Classes are first come, first served, and reservations are recommended at (212) 827-0698. There will be nine classes from April - June, so be sure to check out our calendar for all the details. *Update: The start date for fly fishing classes has been postponed. There will be no class on April 21. Cool, getting some tuition is a must for any beginner and also intermediate anglers can benefit from a class to iron out any chinks.